This past weekend (which feels so far away already) B was out of town. I missed him, but having the bed to myself for three whole nights kind of rocked. Other than being a shameless pillow hog, I had a total self-respect weekend. On Saturday morning I ran errands around the city. Instead of biking I walked, and as the morning went on the sun slowly burnt through the clouds. 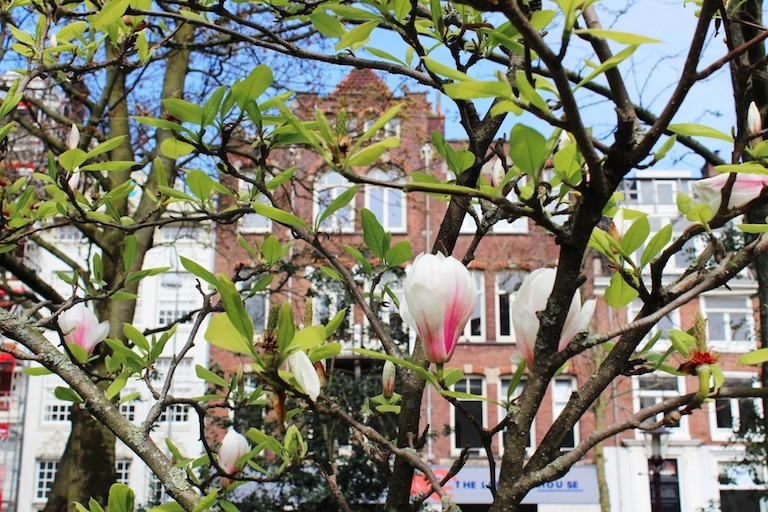 All of the trees are blooming in Holland, and lately the sun has been poking around until well past 8pm. So I think it’s safe to say it’s officially spring, and I’m loving every moment. When my errands were done, I decided to continue the self-respect and try something a bit out of my comfort zone. I’ve lived on the Albert Cuyp Market for three years. 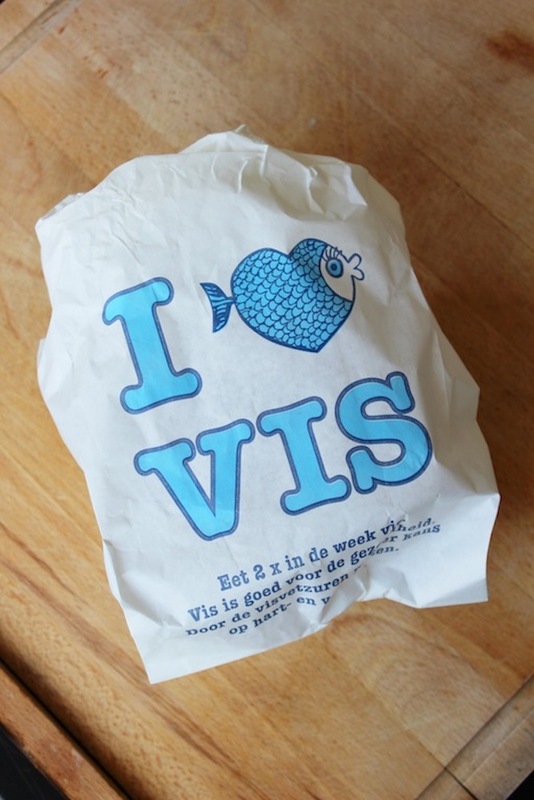 And I LOVE seafood (see here and here). But I’ve never actually gotten around to buying fresh fish from the market, despite the many stalls pushing fresh seafood. It might sound silly, but as an American I’m intimidated by purchasing food that’s priced per kilo, as I didn’t grow up with the metric system. No thank you am I accidentally paying €35 for one piece of fish. 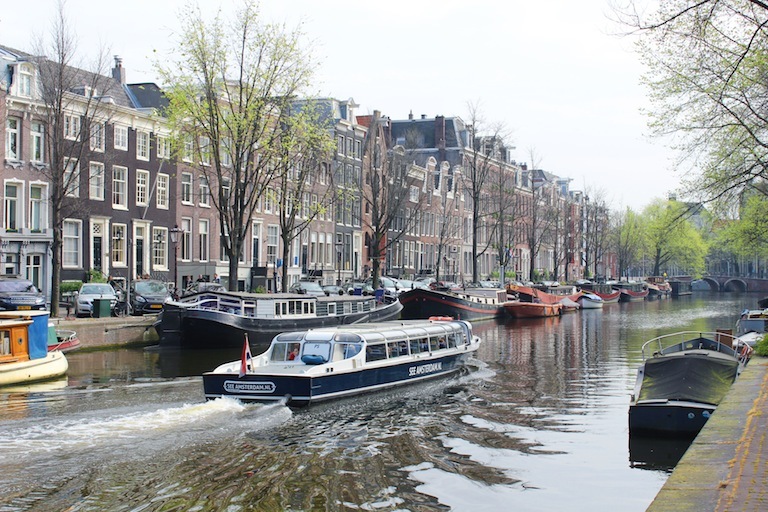 I also don’t speak Dutch, and the fish market is usually quite crowded and loud, which can be somewhat overwhelming for a short (by Holland standards), non-Dutch speaking American. But on Saturday I said screw it. I wanted a big plate of raw fish, and no way in hell was I chancing the stuff from the grocery store. So after running errands, I ventured to the market and pushed my way up to the smelly fish counter. I boldly asked for €8 worth of salmon and tuna. I told the fishmonger that I was making sushi, and he helped me pick out a few pieces that were especially fresh. The experience wasn’t half as bad as I had imagined – in fact it was quite pleasant – and I think my local fishmonger may have a new regular! I got home and was excited to unpack my bounty. I opened up the packaging, stomach growling. And then . . . I stopped. Because I didn’t know what to do. 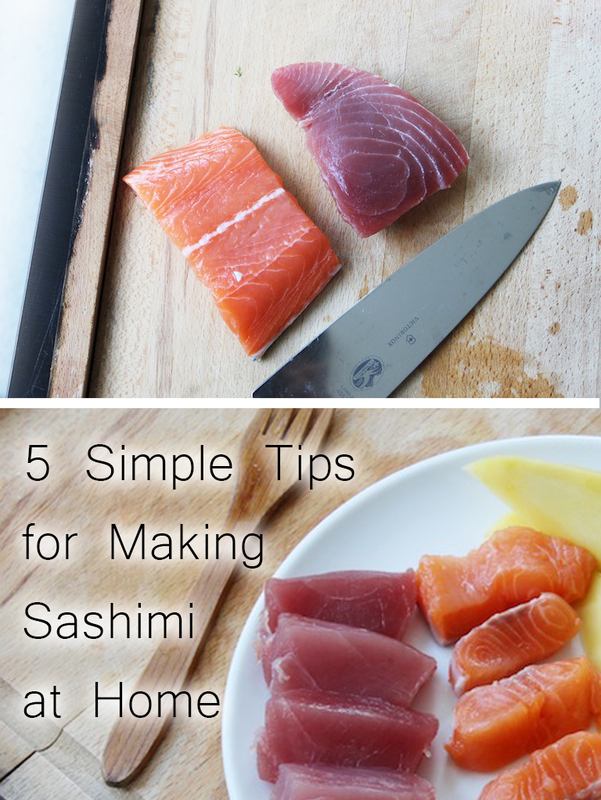 I’ve never prepared sushi at home, and despite just wanting a simple plate of sashimi, I didn’t know what to do next. Did I have to wash the fish? Was there a special way to cut it? Did I have to refrigerate it first? Would it be weird to eat it with a fork and knife as-is? Yes, it would. So I did the next best thing. I did some research. 1) Make sure you tell the grocer or fishmonger you’re buying fish to make sushi. There’s no specific grade or standard for selling sushi-safe fish, so you’re going to have to be careful. Not all fish is created equal, and you’re going to want the freshest stuff they have. Ask for a recommendation. 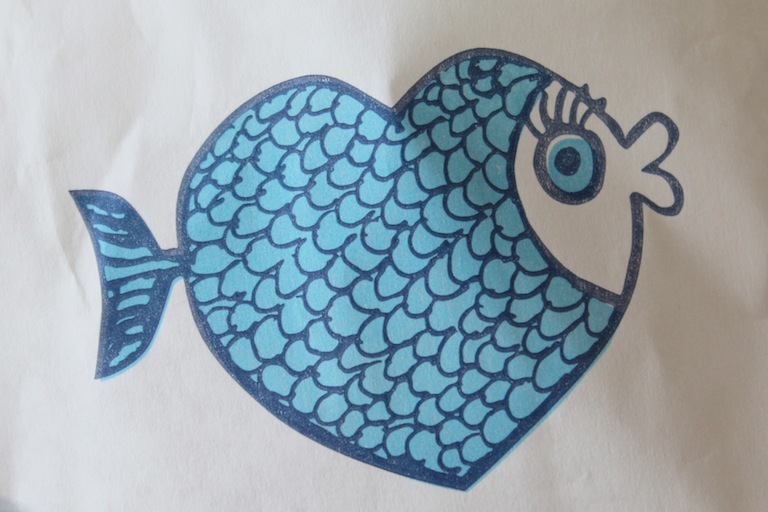 The fish should smell like a salty ocean (not dead fish) and should be moist, with bright skin and a firm flesh. 2) Once you’ve got your fish, you’re going to need a very, very sharp knife. You don’t want to have to saw back and fourth with your knife as you cut the fish – this will crush the cells. You want a very sharp knife that will cut straight through the fish in one firm slice. 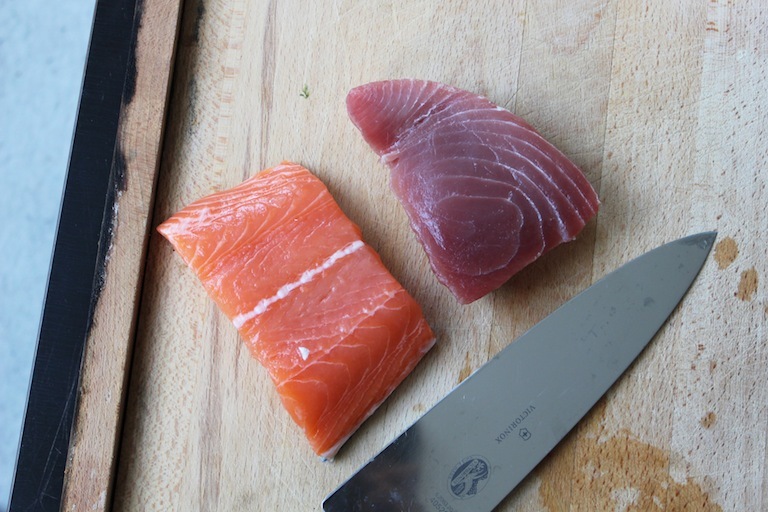 3) When you’re ready to cut your fish, slice it into long strips that are about an inch wide. Now, cut your fish against the grain into ¼-inch thick slices. You should be left with an even pile of bite-sized sashimi. 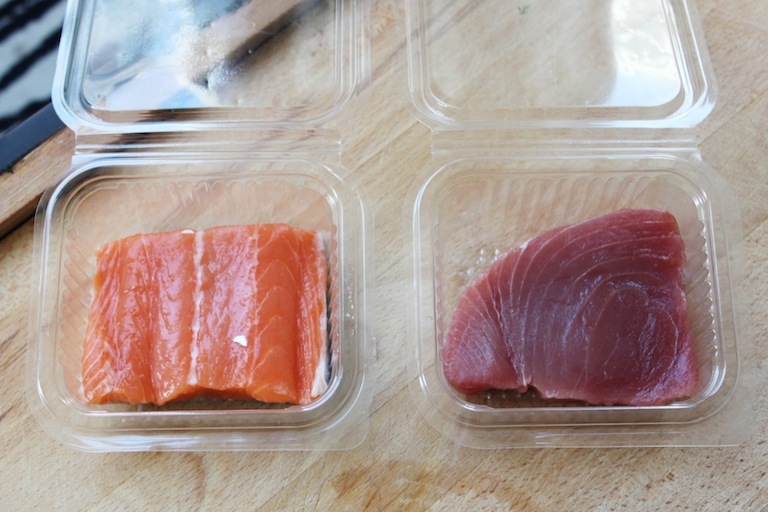 For taste and freshness, you’re going to want to serve your sashimi immediately after slicing. 4) The last step is serving. Pickled ginger, wasabi, soy sauce, and daikon radish are all great sashimi accompaniments. 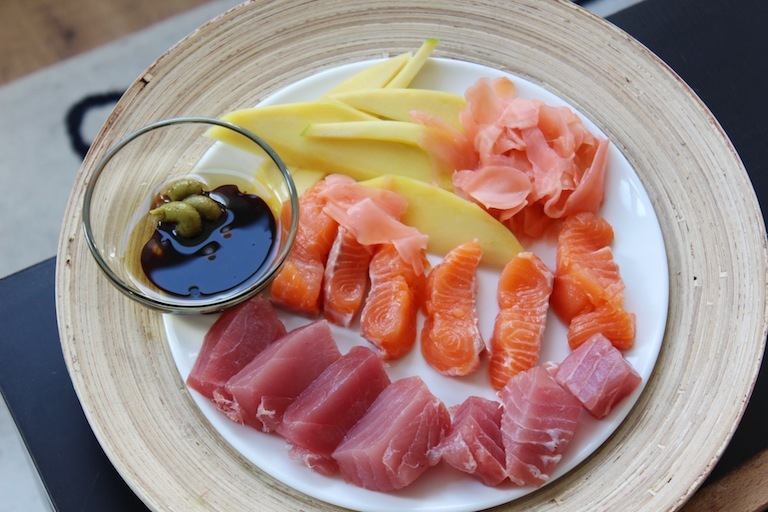 Garnish a plate with you favorites, and then lay down the sashimi. I made my own dressing with sesame oil, soy sauce, and wasabi, and served my sashimi with a big helping of ginger and some mango. 5) Get creative! Once you’ve mastered the basics of sashimi making, you can then start to make some really delicious and unique dishes. Typically sashimi is served as a starter, but you could make it into a delicious tuna and seaweed salad, as seen here, or a sashimi-cucumber skewer, as seen here. Keep in mind that the fish flavors are so powerful, so you want to pair your sashimi with light fragrant fruits, vegetables, and grains that compliment the meal. Bon appetite! Beautiful and a pat on the back for venturing to the fish monger and giving it a try! I love sashimi but haven’t tried it at home. Perhaps I will follow your lead and one day try my hand at it. 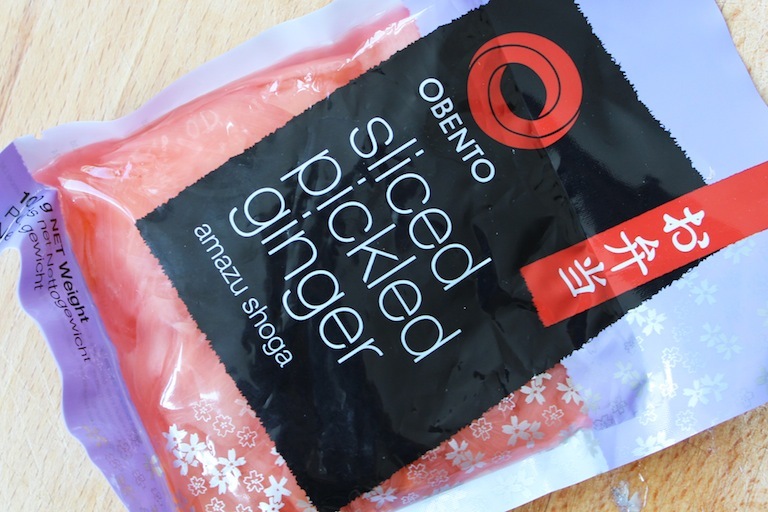 the ginger is used to ‘cleanse your palate’ between different kinds of fish. And, yea, the slices often differ by the type of fish, but often about 1cm thick. Looks good though… I’m hungry!